The photo above shows what my father, Don Griffiths, and I have been up to in the far north. On the 14th of January we were fishing on 90 Mile Beach . We were about 50 metres apart and both using a Bottom Longline Rig. On my first set I caught four kahawai. On the second set I caught one snappper which weighed almost 3kg. Meanwhile Dad was fishing not far from me and on his first set he caught nine snapper all around the 2.5kg with the biggest going over 3kg. On his second set he landed five more snapper. It was a great day and we have some great photos taken on the beach. 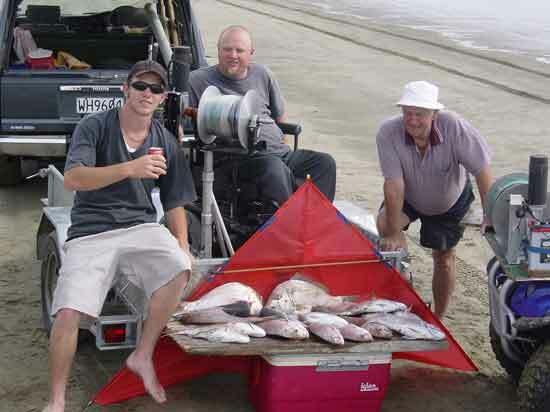 Last Saturday we went to Rarawa Beach and caught seven snapper. Another great afternoons fishing. Jacob Hughes and and his dad came down from Hastings the other day to set his Paul's Super Kite powered rig to try for the big gurnard. They had a great time and managed to catch this good sized gurnard which weighed 1.16kg. Gary & Katrina Ellmers from Waipukurau were out at the beach for their holidays. They purchased a kontiki bag off us and set off down the beach to check out what they could catch for dinner. They returned with an excellent 1.6kg gurnard which is now leading the gurnard section of the competition. 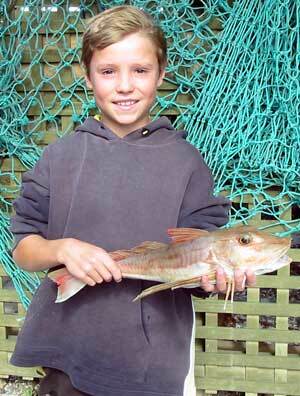 Jacob Hughes with a nice Porangahau gurnard. With only a fews day left in the snapper competition the first prize looks like it might be heading over to the west coast area. A 1.36kg snapper which was caught from Porangahau beach near the Country Club is the only snapper weighed in so far. You have a few days left to beat this fish and win the competition. The snapper are very late turning up this year, they are already six weeks overdue, who knows, that winning fish may even turn up tomorrow? If you are in our area call in, record you catch and have your photo taken. Be in to win a prize in our FREE fishing competition running until midnight 2nd Feb 2003. Snapper - 1st Prize is a Flexiwing Conversion Kit courtesy of Paul's Fishing Kites. Gurnard - 1st prize Okuma Surfcasting Rod and reel. See us at the shop for more details. Want to know how to wind hanks of line on your reel the easy way? Often people contact us asking how to get nylon hanks onto their reel without twists. Buying nylon by the hank is the most cost effective way of purchasing your new line. What to do with it once you are home is the trick. You need a Spinning Jenny to make it really simple, they are a piece of cake to make and will save you a considerable sum on purchasing nylon over time and will not twist the line. If you know anyone who knits they may have one for their skiens (hanks) of wool. 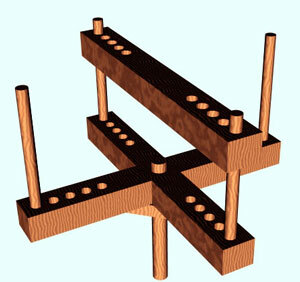 A Spinning Jenny is simply a wooden cross with a centre pin in the middle with four dowel pins, one on each spoke, sticking up. Drilling several holes in each arm allows for adjustment to the hank size. You can also do it withoout a spinning jenny but you need two people. One puts their arms through the hank and only lets one loop off at a time while the other winds the line. To avoid twisting the line with this method the person holding the line should turn the hank around every 50 to 100 coils that are wound off. If you are interested in buying one of the Spinning Jennys send us an email. If we get enough expressions of interest we will look to order them in at a good price. It wasn't the best Xmas for kitefishing at Waipu Cove on the east coast of Northland. However, the Boat Longline worked a gem!!. Over Xmas I was to be frustrated over and over again by the lack of suitable conditions to put the kite out. Then with our boat playing up I thought that my Christmas fishing and diving was ruined! After getting a Boat Longline for Christmas I was very impatient to get out. So bring on the kayak. One evening around 6pm I paddled out to around the 800m mark (right on the reefs) and started to set. First time out I used only one side of my big trace rack, so I could get used to it. Leaving it to fish for around two hours I went to collect it. I had nine fish on thirteen hooks, things were looking good. Five snapper were put in the pan for dinner and one was a good fish around 3kg. We finally got the boat going and set out at around 5pm one evening for a fish. We set the longline and went for a play with the rods. Fishing for two hours we caught three good gurnard. Not holding out much hope for the longline we were pleasantly surprised even after pulling the line in with lots of empty hooks. A couple of baits hadn't even been eaten. Then the telltale sign of tugging by large snapper. Ultimately we caught four snapper all over 4kg and one of them weighed just under 6kg. All this on the Boat Longline and we were rod fishing about 100 metres away on the boat! That happened just before New Year and the weather has been variable since then. I have been out a few times since the start of the year and have managed a couple of pan sized snapper for my effort. I was talking to Paul Keller and he tells me there have been some 4 wheel drives vehicles caught out at Baylys Beach and to the north. This is to the right of the beach entrance. He said the beach seems to have dropped around two metres and there are soft holes in the sand. Some drivers have been caught out in these holes. Apparently it is not possible to drive up to Maunganui Bluff due to the soft conditions. So be aware of the danger, it could be a very expensive mistake. The best advice is to stay up high and don't venture too far. I did two sets at Uretiti Beach, Northland on Saturday. I didn't catch any fish which is unusual for me. Maybe the beach has been hammered over Xmas. The good news is the fish are starting to move right up the Kaipara Harbour. The majority of fish are just under size but this should improve over the next few weeks. I went fishing at Te Araroa, East Cape just after Christmas. A strong wind over 20 knots was blowing this day from the southeast. A southerly is ideal here but it didn't stop me catching snapper, gurnard, kahawai and even a shark. I set my Flexiwing Kite on the high wind attachment point, tacked to the left and got a good fishing angle. My float was a two litre plastic bottle half filled with sand. I put the first set out to around 600 metres. I didn't go further than this because I was fishing alone and decided against a longer retrieve. All five hooks were baited with squid. When I retrieved my set after an hour there was no sign of my float, this is because the bottle had a hole in it and had filled with water. I landed one shark, one just legal snapper and on the trailing hook an excellent snapper of 5kg. A promising start! While I was removing the fish and traces I let the gear go back out into the surf. I found another float bottle and rebaited my traces while my bare gear sat just offshore. When I brought it back in to rebait I found the line broken about 20 metres below the float. I have no idea how this happened but fortunately I had spare hook sections so retied a safety trace and sent it back out again with 10 hooks. I landed two kahawai on this set which makes me think I was not reaching the bottom with the shortened leader section between the float and sinker. The best catch though was on the last hook! It was all my gear that I had lost on my first set. I repaired the damaged section and caught two gurnard on my third set. A pretty good day! I went kitefishing at Whirinaki Beach, East Cape three weeks ago. I was fishing with a Bottom Longline Rig and put out two sets of 25 hooks. I landed three gurnard and three kahawai which I was more than happy with. The wind was from the northwest and light. The tide was coming in during my time on the beach and I was using kahawai for bait.